an employee could be injured or suffer ill health? you may be exposed should an employee submit a claim? you may have a sudden visit by the enforcing authority? costs may spiral out of control? A good starting place is to have a visit by one of our qualified consultants. They will undertake an audit to identify the risks to your employees, contractors and visitors along with reviewing what you already have in place. You may already have systems in place which merely need reviewing and bringing up to date. You may have no documented health and safety management system in place but want practical and realistic advice on what you need to implement, to sufficiently manage your risks. We can offer clear advice which is in proportion to your risks. An audit is a systematic, independent and documented process. This allows you to measure your safety management systems consistently, with the aim of achieving continuous improvement. The main reason is that all employers must comply with health and safety legislation. This includes the Health and Safety at Work Act etc 1974 and the Regulations made under this Act. You must regularly examine the quality and effectiveness of your health and safety management systems. 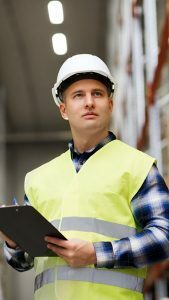 It is notable that when the Health and Safety Executive undertake their investigations into major accidents, it usually highlights health and safety management failures as being the root of the cause. How is an audit undertaken? Initially, one of our consultants will visit your premises and complete an initial evaluation of the systems and procedures already in place. Checking compliance with current health and safety law. This will involve reviewing your current documentation such as policies, risk assessments, training records, work instructions, inspection records etc. A physical inspection of your site will then be undertaken. This will identify any hazards which require improved management and discussions will be held with your employees. If a weakness is identified, it will be detailed within an Audit Report which includes an evaluation of what is required and an action plan to make the necessary improvements. So, what are the benefits of an audit? Improve your compliance with the law. Benchmark your organisation against other organisations outside or within your sector. Having an independent auditor of your policies and procedures means that you get a reliable, unbiased report of findings and an objective action plan for improvement. Control systems weaken over time and need to be constantly reviewed. It helps demonstrate management commitment to employees and third parties. Once your audit has been undertaken, you’re now in a better position that you know what needs to be implemented to better protect your employees, visitors, contractors and your business. You may have the resource internally to complete the actions, or you may choose for one our consultants to visit and support you with this process. We offer various consultancy packages. These are specifically designed to suit individual business needs following audits. We pride ourselves in getting to know and understand specific business requirements and developing consultancy packages that are right for businesses, in terms of supporting their needs and budget. If you’d like a chat to discuss any assistance that you may require in getting focused and drawing up an action plan, then please get in touch.